Indianapolis, IN (July 26, 2016): David Weekley Homes recently opened three new model homes in two Indianapolis-area communities – Jackson’s Grant on Williams Creek - Creekside and The Village at Flat Fork. Two model homes are now open in Jackson’s Grant on Williams Creek - Creekside. The Mitchner is a two-story home with five bedrooms, five full baths, two half baths and a two-car garage with additional storage. In addition to an open-concept two-story family room, the home also includes a study, main floor owner’s retreat and expanded outdoor living area. The Brunson includes four bedrooms, four full baths, one half bath and a two-car garage. The one-story home includes an open-concept kitchen, spacious family room, study and covered outdoor living area with fireplace. Homes in the Carmel community of Jackson’s Grant on Williams Creek- Creekside are priced from the $540s. Homebuyers can choose from six floor plans. Community amenities include expansive natural areas with walking trails and a planned community center. Students attend Carmel Clay Schools. The community also offers convenient access to U.S. Route 31 and I-465. Located in the community of The Village at Flat Fork, The Paddock is a one-story home offering 2,800-2,900 square feet of living space, including a finished lower level with a kitchen/bar. This home features five bedrooms, four full baths, one half bath, spacious study and a three-car garage. The home also offers 10-foot ceilings on the main floor, a covered back porch surrounded by trees and a retreat for children or guests. David Weekley Homes in Indianapolis are energy-efficient homes backed by the Environments For Living® program’s heating and cooling energy usage guarantee. For more information about Jackson’s Grant on Williams Creek - Creekside, call 317-669-8636 or visit the model home at 12315 Jacksons Grant Boulevard in Carmel. 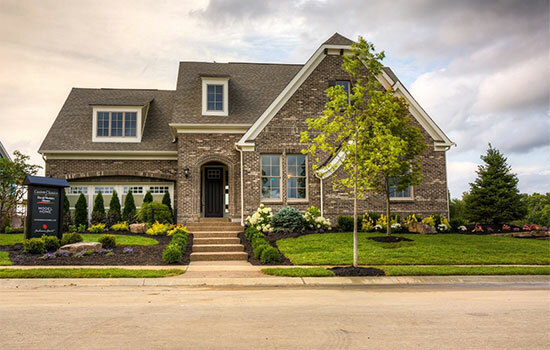 The Paddock model home in The Village at Flat Fork is located at 10903 Cliffside Drive in Fortville. To learn more about homes in The Village at Flat Fork, call 317-669-8635. The Brunson model home in Jackson's Grant on Williams Creek - Creekside.